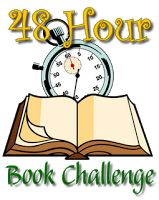 So, one awesome thing about the 48 Hour Book Challenge is that it's a great opportunity to whittle down your TBR (To Be Read) pile. But if you, like me, have a hundred or so books on said pile, it's worth thinking about which of those books you might want to tackle this weekend. Everyone's different! Maybe you want to immerse yourself in a series this weekend or maybe you prefer a little more variety. Maybe you want to tackle the thousand-page novel you've been meaning to read or maybe you like to stack up a bunch of short books so you can tick a bunch of titles off your list. Maybe you have committee reading or school reading you have to do and you don't get a lot of choice. Now's the time to think about it and get your reading pile(s) all situated. When in doubt, err on the side of variety! So, I took to NetGalley, I sought out The Stars So Far, I perused publisher catalogs on Edelweiss, I started checking out our New Book shelf at the library and snagging books by favorite authors. What works for me is to read books that I'm really looking forward to, short or long, new or older. What also works for me is to have a variety and be able to switch it out throughout the weekend. I'll have a mix of middle grade and YA novels, adult books, nonfiction, and an audiobook. And I have way more books available than I'm actually planning on reading. What titles are on YOUR TBR pile this year? * Sidenote: my favorite thing to do, since I've been on the YHBA Committee the past couple of summers, is to make a committee reading goal to hit before the 48HBC. That way, I can feel guilt-free about taking the whole weekend to read whatever I want!